Our team of three electrophysiologists provide the latest in the treatment and management of heart rhythm conditions. They perform studies and procedures to test the electric activity of hearts to find out where arrhythmias come from as the heart pumps blood. They then can determine if a patient needs medicine, a pacemaker, an implantable cardioverter defibrillator (ICD), cardiac ablation, WATCHMAN or surgery. 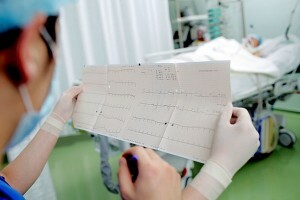 Atrial fibrillation (AFIB) is the most common heart rhythm abnormality that starts in the atria. This condition is usually associated with a rapid irregular heartbeat (arrhythmia) that can lead to blood clots, stroke, heart failure and other heart related complications. More than 2.7 million Americans are living with AFIB. Sometimes patients feel fatigued and weak. Others do not have many symptoms. We specialize in cardiac ablation that is a procedure to scar or destroy tissue in your heart that’s allowing incorrect electrical signals to cause an abnormal heart rhythm. Diagnostic catheters are threaded through blood vessels to your heart where they are used to map your heart’s electrical signals. The latest procedure we also do to manage and prevent AFIB is the WATCHMAN LAA Closure Technology that consists of a delivery catheter and a device that is permanently implanted in the left atrial appendage (LAA) of the heart. This device, often referred to as the WATCHMAN, prevents LAA blood clots from entering the bloodstream and potentially causing a stroke.